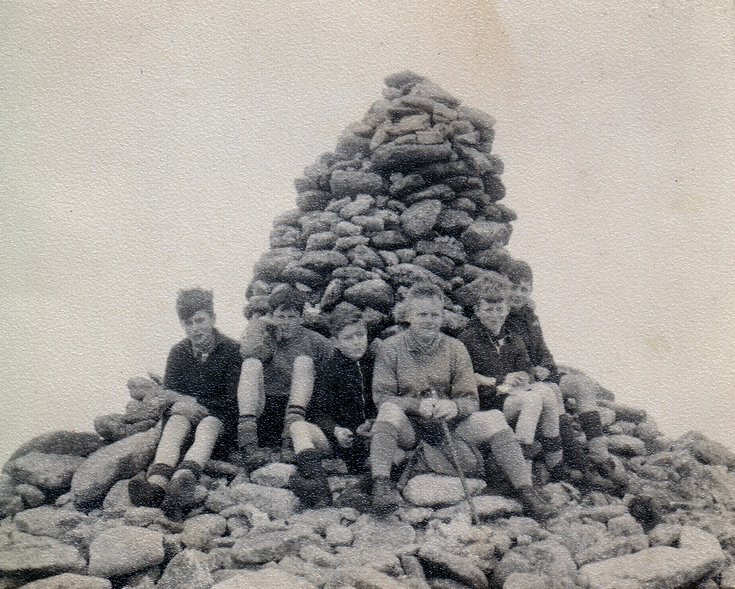 Monochrome photograph taken by Scoutmaster Fred Savage and the troop members are (from the left) Leonard Will jun., Malcolm Mackintosh, Duncan Bethune, Group Scoutmaster Leonard Will Sen., Hamish Leslie and Michael Robertson. This is the final photo of a sequence picture #5290 - rising in the morning after sleeping on the bare hillside. 004.14 - picture # 5301 getting ready to set out up the mountain after breakfast 004.13 - picture #5300 walking up the track on the side of Corrie Cas. 004.04 - picture #5291 Checking out the snow at the top of Corrie Cas. In response to viewing the Image Library, Hamish Leslie sent an e-mail with this photograph attached and the following comments. "I am the Troop Leader H Leslie referred to in objects 2001-099-001-001 to 106. I have a few of these scout camp photos I could acan and send if you are still interested. ~ Yes please, that would be great. Please just email them to enquiries@historylinks.co.uk. The caption of this picture shows "Year: 1930", but as Hamish Leslie says, it should be 1955. I can't confirm that, but it is plausible - I would have been 14 at the time, and that looks about right. ~ Thank you I have amended the date. Administrator.